This summer, John Jay offered the highest number of faculty-led programs ever and had the highest number of students studying abroad in the College’s history. 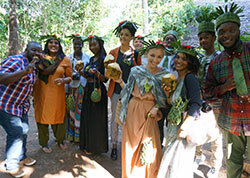 Seventy-four John Jay students participated in study abroad programs in Cuba, Tanzania, Ecuador, Spain, Indonesia, China, Japan, Italy, Great Britain, Germany, South Africa, and Morocco. Organized by dedicated faculty with the support of the John Jay Office of International Studies and Programs, the College enabled students to gain rich cultural and academic experiences around the world. Read detailed accounts about three of this year’s study abroad programs led by Professor Lisandro Pérez, Chair of the Department of Latin American and Latina/o Studies, in Cuba and Assistant Professor Crystal Leigh Endsley of the Department of Africana Studies in Tanzania, and Professor Rosemary Barberet of the Department of Sociology in Spain. 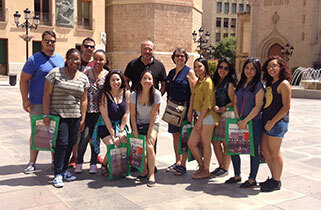 Eleven students spent three weeks at the Universidad Jaume I in Castellón de la Plana (Valencia), Spain, with Professor Rosemary Barberet of the Sociology Department for the study-abroad program “Por la Justicia Social: Crime Victims in Comparative Context.” As designed by Dr. Barberet, who has 15 years of experience in academic criminology in Spain, the program required fluency in Spanish and featured many opportunities for immersion in the local culture. Read more and view photos. Twelve John Jay students, joined by one Brooklyn College student, participated in a study abroad course that took them to Cuba for two weeks in July at a time when history was made. While the students were in Cuba, full diplomatic relations were established between that country and the United States, relations that were severed more than 54 years ago. 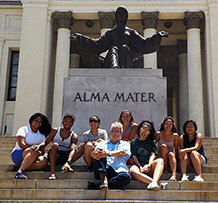 The group was led by Professor Lisandro Pérez, Chair of the College’s Department of Latin American and Latina/o Studies. The students were enrolled in LLS 260, History of Contemporary Cuba, taught by Professor Pérez, which met for classes on the John Jay campus and at the University of Havana. During the month of July 2015, seven John Jay College students and two Hunter College students participated in the first-ever John Jay College study abroad program offered in Zanzibar, Tanzania. Students were enrolled in AFR 280 course entitled Tanzania: Exploring Arts, Culture, and Society led by Africana Studies Assistant Professor Crystal Leigh Endsley. Over a period of four weeks, students traveled Zanzibar, meeting with ministers of government, conducting arts and poetry workshops, installing three We Share Solar Suitcases for sustainable energy, and volunteering at the Zanzibar International Film Festival.